The IBIS is awesome for the serious storage junky, but its unique RAID-derived technology doesn't always deliver real-world benefits for everyone. It's fashionable among the technologistas to grumble about the quality and performance of solid-state drive controller chipsets. But controllers aren't the only problem with SSD performance; increasingly, storage interfaces are creating a bottleneck. 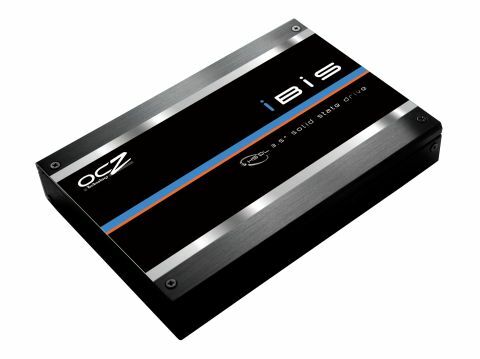 Enter the OCZ IBIS HSDL 240GB, an ultra-high performance SSD designed to sidestep performance issues related to the SATA I/O interface. The OCZ IBIS HSDL 240GB does this courtesy of its own unique storage connection. Out goes SATA, in comes OCZ's proprietary High-Speed Data Link or HSDL for short. In simple terms, HSDL is a four-lane PCI Express link. PCI Express 2.0, of course, supports 500MB/s per lane. Potentially, therefore, HSDL can manage a massive 2GB/s of raw storage bandwidth. This first incantation of HSDL is PCIE 1.1 and thus half that speed, but on paper it's still a fair bit quicker than SATA. As for the SSD part of the package, the IBIS packs 240GB of flash memory and no less than four SandForce SF-1200 controllers. There's also a Silicon Image RAID controller. The whole ensemble acts like four high end SSDs in a fast RAID 0 array. It's a bit like a quartet of OCZ's SandForce-powered Vertex 2 drives squeezed into a single 3.5-inch box.